Apple has reported a jump in sales in the three months to September, driven by sales of its iPhone. The tech giant's revenue was $51.5bn (£33.6bn), up 22% compared with the same period last year. It sold more than 48 million iPhones in the period, which it said were "record fourth quarter sales", although the figure did miss analysts' expectations. "The growth was fuelled by record fourth quarter sales of iPhone, the expanded availability of Apple Watch, and all-time records for Mac sales and revenue from services," the company said. In China, the biggest market for smartphones, Apple's sales nearly doubled from a year ago to $12.52bn. Apple now has 25 stores in China and is opening a new one every month in a market that supplies about a quarter of sales. 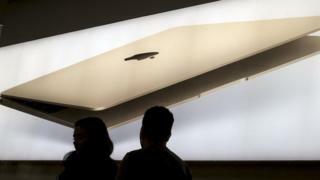 That sales figure is a dip from the prior three-month period, however, when Apple recorded revenues of $13.2bn in China. For the current quarter, Apple estimates global sales of between $75.5bn and $77.5bn. Morningstar analyst Brian Colello said the forecast was slightly below market expectations, but investors were expecting a worse outcome, which was why the stock initially rose 3% in after hours trading.